Guwahati (Assam) : With the completion of three years in power today, Prime Minister Narendra Modi on Friday introduced a food processing scheme, ' Sampada', adding the agriculture sector of India needs to be modernized for the economic growth. "The government wants to strengthen the farmer community by doubling their incomes. Farmers' income should be doubled by 2022, it's time to increase our progress gradually," the Prime Minister said while addressing the crowd here. Earlier in the day, Prime Minister Modi inaugurated India's longest, Dhola-Sadiya Bridge in Assam. (BJP) to a massive victory in the 2014 Lok Sabha elections. Prime Minister Modi, after the inauguration, addressed the media and dedicated the bridge to people of Assam. The Prime Minister asked the people of Assam to take out their mobile phones and start the flash to celebrate the special day. He was accompanied by Union Minister Nitin Gadkari and Assam chief minister Sarbananda Sonowal. The Prime Minister congratulated the Assam Government for the construction of the bridge and said it will be named after Assam's beloved singer, Bhupen Hazarika. 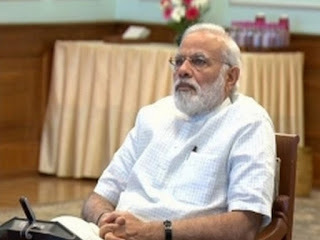 Speaking on the BJP's one year rule in the state Prime Minister Modi said that within one year of party's rule in Assam, the state got rid of a lot of problems. The total length of the Dhola-Sadiya bridge project, including the approach roads on each side, is 28.50 km while the length of the bridge itself is 9.15 km. The bridge will reduce the distance from Rupai on NH-37 in Assam to Meka/Roing on NH-52 in Arunachal Pradesh by 165 km. The BJP will be organising a pan-Indian festival-like publicity campaign to highlight the achievements of the Narendra Modi-led NDA three-year rule. The campaign's name has been linked with the surname of the Prime Minister- ' Making of Developed India (MODI).